It's time for Seize The Birthday, and for this challenge, our optional topping is Tags - large or small, on a card or on their own. I've created a tag using one of the techniques from Tim Holtz' Creative Chemistry 103, and added a double-layered butterfly (Tim Holtz) and sentiment (Neat & Tangled). I coloured some tape using the same colours I'd used on the tag and butterfly. It looks a bit dull and grungy on the photo, but it's prettier in real life. Pop on over to the Seize The Birthday blog for some more fabulous inspiration, and play along. If you don't want to use a tag, you can still join in as long as it's a birthday project. Gorgeous!!! I love the 'double' butterfly and once again, your amazing color selection and your cool design! I'm with Darnell...the butterfly would make a beautiful brooch! This is truly stunning! the colors you've achieved are amazing! Beautiful tag. Love that pretty butterfly. 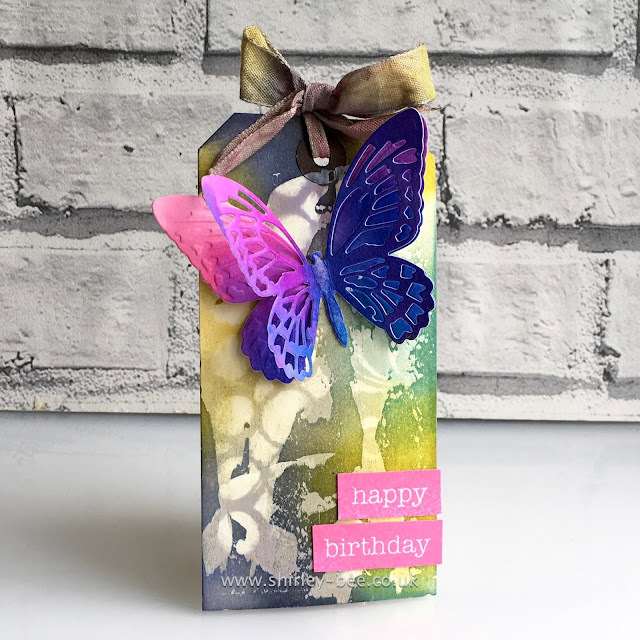 Really love the double layered butterfly...going to have to remember that! Such a great tag Shirley! I am loving the background and that gorgeous butterfly! Beautifully done!